The price of food continues to rise and will do so for the next 10 years. The reasons include increased fuel prices, the role of market speculators and a combination of political malfeasance and administrative ineptitude. The result, however, is certain: More people will go to bed hungry every night. By DONALD PAUL. In a panel discussion on land reform the chairman of the parliamentary portfolio committee on rural development and land reform Stone Sizani countered the argument that farming the land should have priority over restitution where the land claimants do not continue farming (or fail), and dismissed the notion that food security was an issue in South Africa. Sizani’s response highlights the complexity of food security. While his statement is correct—SA does produce enough food—it overlooks the fact that a significant number of individuals go to bed hungry. This is largely due to poverty, unemployment and issues of distribution and accessibility. The government has committed R150 billion over the next three years to tackle unemployment and hopes to generate 5 million jobs in the next decade. People who are food insecure, however, cannot wait for a budget plan to kick in. If you are hungry today, you need to be fed today. Social security grants and the increase in people who are eligible, to some extent curtailed the number of food-insecure households, but only marginally. The exact number of such households is not known. The Human Sciences Research Council through its Centre for Poverty, Employment and Growth found the 2007 General Household Survey indicated more than 11% of adults and children were “sometimes or always hungry”. The 2005 National Food Consumption Survey claims 52% of households experience hunger. Robert Fincham, Emeritus Professor of the University of KwaZulu-Natal and a founding trustee of the Msunduzi Innovation Development Institute, recently conducted a study in the townships and found “93% of households in the townships [around Pietermaritzburg] were food insecure”. The study covered 11 SADC countries and the results were all in the 80% range. Increasing commercial farming output and improving distribution would seem an obvious solution. It’s worth noting that the 2002 census on agriculture showed a decrease of 12,162 commercial farming units since in 1993. It is also the commercial farms that indirectly contribute to price increases through greater use of oil-based fertilisers, commodity speculation along with transport costs, an expensive component in the food chain. Yet we are experiencing “de-agrarianisation”, moving from smallholder/subsistence agriculture to agribusiness. Agricultural economist at the University of the Free State Mompathi Baiphethi and economist Peter Jacobs of the University of the Western Cape in an extensive study of the role of smallholder farmers found “subsistence production and/or smallholder production can increase food supplies and thus cushion households from food price shocks, thereby improving household food security”. This is not a popular position, but it is endorsed by the Farmer Support Group at the Centre for Environment, Agriculture and Development at University of KwaZulu-Natal. Maxwell Mudhara, who heads the group, works mainly with smallholders farming communal land. The main problem they encounter is bridging the divide between subsistence farming and producing a surplus for the market. The farmers consistently run up against the bureaucracy and perfidiousness of those within the agro-food chain, including supermarkets, processors and distributors. Fincham instigated a survey of supermarkets and their role in the food chain. The survey looked at environmental and socio-economic impacts of their business practices, factors such as waste management and carbon footprints. Shivani Naidoo was part of the research team that looked at five supermarkets—four national chains and one local. “In terms of local economic development and sourcing locally, it seems to be a huge issue with the supermarkets. We had examples of produce from Durban, sent to Johannesburg and then brought back to go on the shelves in Pietermaritzburg,” she says. This problem led to the establishment of LEGAC (pronounced “le-ga-see”)—Leading Economic Growth through Agricultural Commitment. As Fincham points out, small farmers are giving up because they can’t access markets for their produce. And when they do, it is often not financially viable. He cites the example of a smallholder taking a bakkie-load of butternuts to the market and getting only R350 for the lot, not enough even to cover fuel costs. Donald Paul is a freelance writer. This the third and final in a series of three articles made possible by an Open Society Foundation for South Africa Media Fellowship. 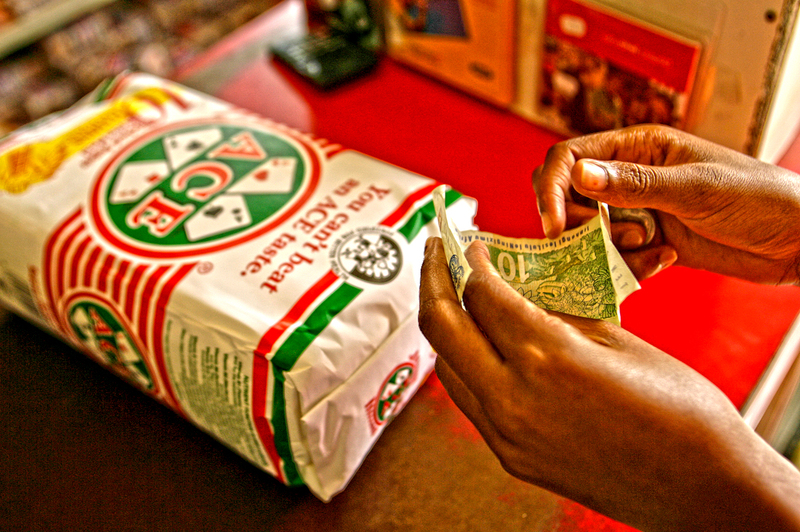 Photo: A customer prepares to pay for a small bag of maize meal at a shop in Soweto south west of Johannesburg, March 23, 2008. Food prices are soaring, a wealthier Asia is demanding better food and farmers can’t keep up. In short, the world is in a food crisis that is in danger of boiling over. REUTERS/Siphiwe Sibeko.